Disney’s Pop Century resort will take you back in time. Larger than life iconic memorabilia garnishes the entire resort. Enjoy a fun, colorful stay. Rooms are clean and all hallways are exterior. There are three themed pools including the Hippy Dippy pool, the Bowling Pin Pool, and the Computer Pool. Preferred rooms at this resort will put you closer to Century Hall where you will find dining, shopping, check in, concierge services, and the arcade. 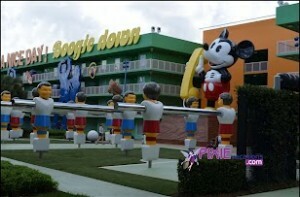 The resort is divided into five themed sections; 50’s, 60’s, 70’s, 80’s, and 90’s. Each themed area showcases popular toys, games, and icons from that decade! Everything Pop- This is a food court featuring many choices for a variety of tastes. Pizza and Burgers are standard offerings along with Asian Infused dishes, Italian meals, and A variety of baked good and desserts. Pizza Deliver: Pizza can be delivered right to your room daily until Midnight! Pool Side Bar: Petals Pool Bar is located at the Hippy Dippy Pool right outside Century Hall. Drinks and limited snacks are available. Swimming: There are three pools at Pop. Each one has a different theme. Pools do not feature water slides or towel service, so please bring towels from your room. Room service will replace them. Arcade: Pop Century features the Fast Forward arcade where you can play for tickets which are redeemable for small prizes. Shopping: Everything Pop features a large gift shop where you will find shirts, hats, pins, and other souvenirs along with incidentals and pre-packaged snacks. Transportation: Buses are available to all four theme parks as well as Down Town Disney, and both water parks. This Resort is Great For: Families with young children who want to spend a lot of time in the parks. Also great for value minded couples or friends on a weekend getaway! Quick Review: Pop is a fun and family friendly resort that offers a great value. If loud colors and over the top themes are not up your ally you may want to look elsewhere for lodging. A great resort for the theme park lover who needs a comfortable bed and a clean shower. Good food, big pools, and a well maintained grounds. This entry was posted in Resort Spotlight, Uncategorized, Value Resorts and tagged Planning, Pop Centure, Recreation, Resort, Value. Bookmark the permalink.